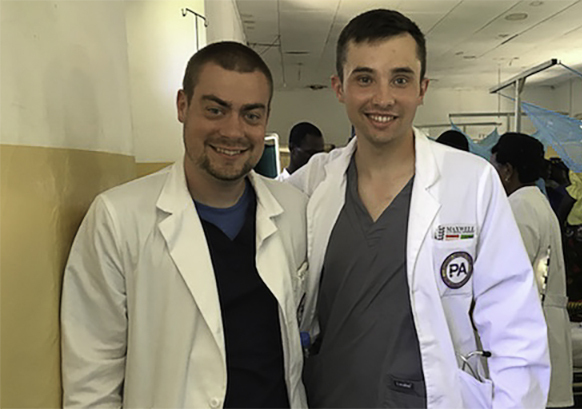 Alumni Matt Tieszen and Blake Rogers, both graduate students in the physician assistant program at James Madison University, recently returned from an elective clinical rotation at Shirati KTM Hospital in Tanzania. Tieszen graduated from Eastern Mennonite University (EMU) with a degree in biology in 2010 and an MA in biomedicine in 2015. Rogers, a 2014 graduate with a degree in biology and environmental sustainability, was honored the week before departing for Tanzania with the national PA Student of the Year Award from the American Association of Physician Assistants (AAPA). Read EMU coverage of the award. He wrote about their experiences in Tanzania in a blog post for AAPA. Tieszen and Rogers were the first PAs from JMU’s program to complete a clinical rotation there; the hospital has regularly hosted JMU nursing students, 10 of whom were part of this summer’s group. Shirati serves a rural population of more than 200,000 with limited resources, including, as Tieszen and Rogers found out, diminished blood supplies. While the two were assisting with an emergency Caesarean section, the patient’s uterus ruptured and the preceptor asked if anyone was a universal blood donor. Days were spent making rounds through the four wards: for male, female, maternity and pediatrics. In addition to assisting with daily deliveries, the duo treated patients with malaria and schistosomiasis, scrubbed in for surgical cases, which ranged from hernia repairs to extremity amputations; and assisted with community outreach programs that ranged from blood glucose screenings to HIV education workshops. He spent his EMU cross-cultural experience studying biology and Spanish in Bolivia and the Galapagos Islands. A medical mission team experience in Port-au-Prince, Haiti, confirmed his desire to enter the medical field, he said. “Each opportunity abroad has added depth to my understanding of the world and how I impact it,” he writes. In addition to pursuing his PA degree, Blake is also a member of the local emergency services and has been a volunteer instructor for EMS services. What an opportunity to learn while serving others. I had the opportunity to get acquainted with Blake and Matt as PA students serving Harrisonburg Rockingham Free Clinic patients. It is rewarding to see them choose to serve underserved populations in other places around the world. Keith, my experience with HRFC confirmed my desire to care for those underserved. I appreciate all that you and the staff at HRFC did to facilitate the JMU PA Program, allowing my colleagues and I to assist in providing health care to community members in need. Glad for the opportunities they had at Shirati! I spent 30 years teaching in the nursing school at Shirati as well as working in the hospital, doing maternal child health clinics in local villages, working in the many departments in the hospital, and learning the language and culture. Over the years EMU has provided many health professionals for the hospital. One goal was to help nationals to become professionals and give the health care. I am delighted to learn that graduates of EMU are able to go to Shirati and learn. Verle, thank you for your service to Shirati. I’m grateful for the opportunity to experience health care outside of the United States. The hospital is a vibrant community resource for health care and education.